Rebecca Hall wears a Zero + Maria Cornejo jumpsuit, Anna Sheffield bracelets, and a Yael Sonia ring. 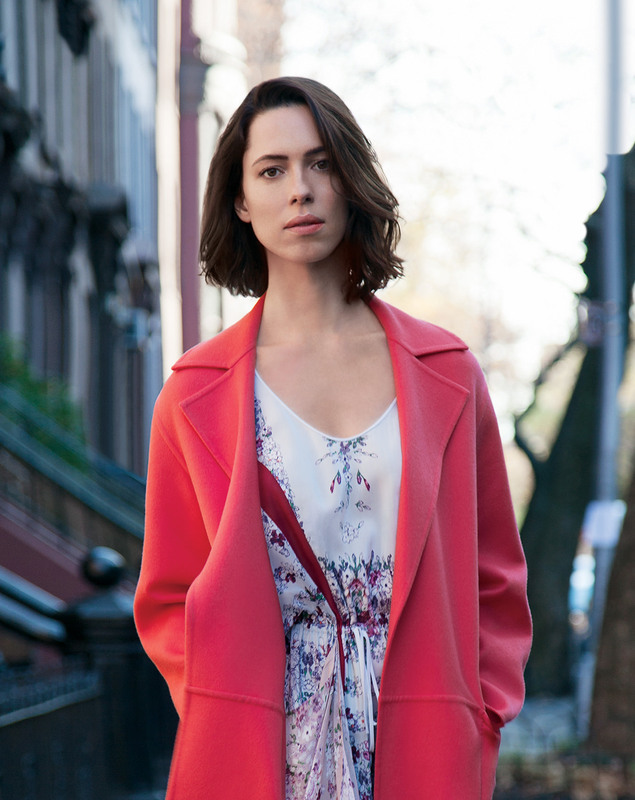 Rebecca Hall wears a BCBGMAXAZRIA dress and a Max Mara coat. Rebecca Hall wears a Louis Vuitton dress and blazer. 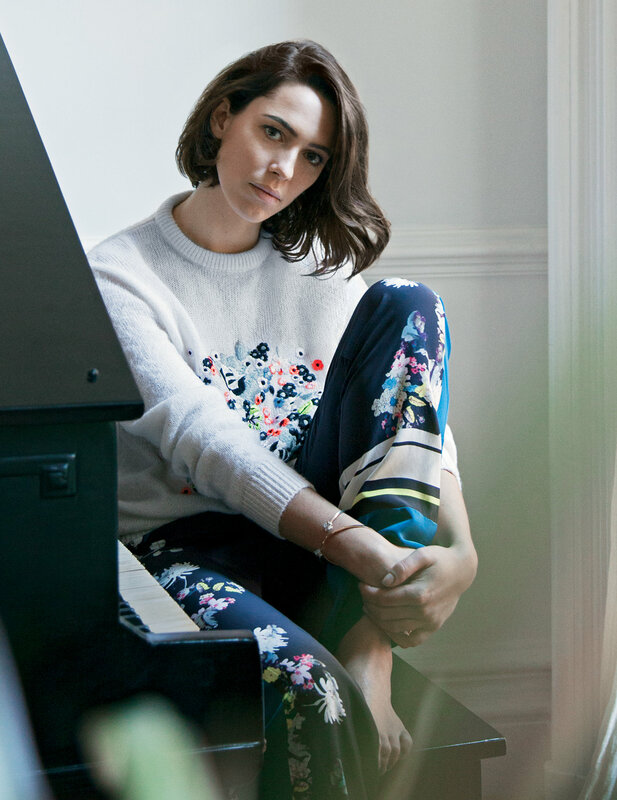 Rebecca Hall wears an Erdem sweater and trousers, Anna Sheffield bracelets, and a Yael Sonia ring. Strapped into an electric chair isn’t a scenario most actors would envisage when planning their Broadway debut, so it’s a testament to Rebecca Hall’s drive that she is “electrocuted” onstage six evenings and two matinees a week for Machinal. The drama tackles a controversial and much-sensationalized case surrounding the trial and execution of Ruth Snyder in the 1920s, the first woman to be condemned to the electric chair in the state of New York. Hall plays the Young Woman (metaphorically the Everywoman), an unfulfilled stenographer. Throughout the show’s run, the actress has had to stay focused on a difficult script written with a poetic cadence that would drive the most seasoned thespian up the wall. “[When I first] tried to learn one of the verses, I hurled the play across the room,” Hall says with a straight face, before pretending to throw an imaginary script and crumbling into laughter. And that—bursting into laughter, not slinging screenplays—is something Hall does often, which makes another of her tendencies, taking on challenges, that much easier. The 31-year-old Brit has logged 10 plays (especially slanting toward the Shakespeare sort) and 15 films, including Woody Allen’s 2008 film Vicky Cristina Barcelona, her breakout role, and more recently, director Shane Black’s blockbuster Iron Man 3, where Hall shared the screen with Gwyneth Paltrow and Robert Downey Jr. This April, she will appear in Wally Pfister’s directorial debut Transcendence, a science-fiction blockbuster, proving that the steadily growing spotlight on Hall has been set to a full-strength glow. For an actress who once guided her career choices using a three-to-one movie-to-play ratio, she admits that’s a plan of the past. “I got offered movie roles that kept getting better and better,” she says. “I couldn’t say no.” Still, her ability to seamlessly transition from stage to silver screen remains, as does a craving for variety and substance. And that’s what brings her to New York. Hall is only running on two hours of sleep after having flown in from London the evening before, but she appears anything but exhausted; her sense of humour is sharp and her eyes are alive. With a mug of Earl Grey in hand (she is British), the actress contemplates her six-month stretch in the city, and the play she’s here to star in. “It’s bold. It’s not realism,” says Hall of Machinal. “It’s episodic—it’s not linear.” Originally a 1928 work by Sophie Treadwell, the play was revived for a Broadway run (from January through March) by the Roundabout Theatre Company and directed by Lyndsey Turner. With its dark subject matter and dense dialogue the script “terrified” Hall upon first read, but she still signed up enthusiastically. “It’s incredibly emotional and impressionistic, and the language is like poetry most of the time—it reads like a piece by Samuel Beckett,” she says. “But the effect is that it makes you feel like you’re being strangled.” And again, Hall’s charming intellect combines with a trenchant wit and all at once you know that if anybody can tackle the tricky lines, it’s her. Is the preparation or experience of acting in a Broadway play different from acting on a Shakespearian stage? “No, my perspective would be all squiffy and wrong if I started thinking that with Broadway I had to adapt myself differently than any other job,” says Hall. “I’m still on a stage doing a play, and the play’s the thing, you know.” Her hand flies to her mouth. “I just quoted Shakespeare—I didn’t mean to say that. ‘The play’s the thing’—it’s from Hamlet. I feel like one of those crazy actors quoting Shakespeare,” she says, laughing. To hear Hall cite the Bard is really no surprise, because she grew up among British theatre royalty; she’s the only child of director Peter Hall, who also founded the Royal Shakespeare Company, and Maria Ewing, the Detroit-born opera singer. Hall attended Roedean, a private girls’ school in Sussex, before immersing herself in English literature at Cambridge University. After her second year, Hall dropped out, believing that she had accomplished all she’d set out to do there and was ready for the next step. She has proven that without any doubt, both on stages and on screens big and small. Hall’s first professional role was at the age of 10 in her father’s television adaptation of Mary Wesley’s The Camomile Lawn. Since then, her theatrical roles include the likes of Twelfth Night, as Viola, in London’s National Theatre; Chekhov’s The Cherry Orchard, as Varya; and The Winter’s Tale, as Hermione. The last two were in 2009 for the ambitious Bridge Project, for which a transatlantic company of actors performs in seven cities, and also tapped the talents of Hollywood heavyweights such as Kevin Spacey and Ethan Hawke. Hall was praised by British television audiences for her portrayal of Sylvia Tietjens in Parade’s End, the 2012 HBO/BBC costume drama (Hall won a Broadcasting Press Guild Award as well as BAFTA and Critics Choice Television Award nominations for the performance). 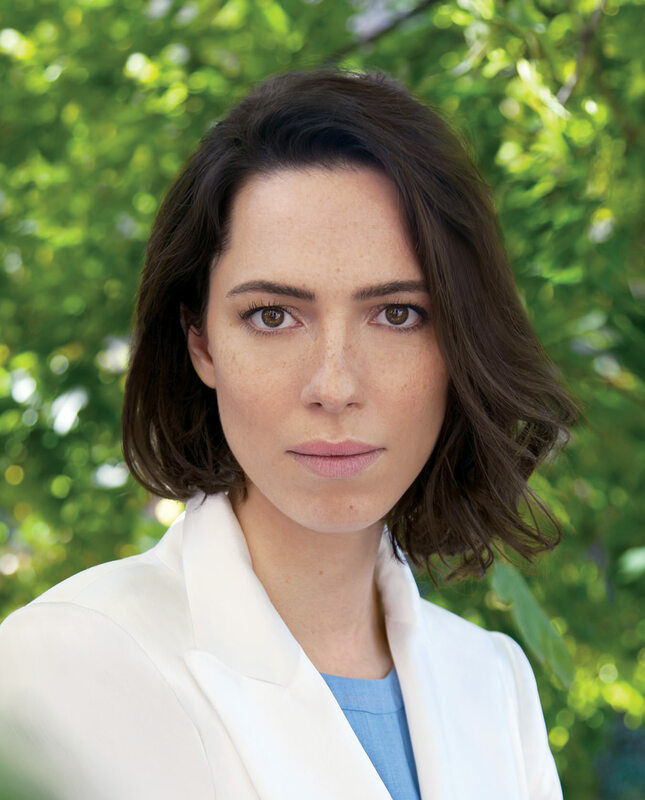 Rebecca Hall’s characters receive sensory personas: she wears specific fragrances for each role. On the set of Frost/Nixon, it was a rich patchouli scent to capture the heady vibe of the psychedelic seventies. Her fastidious acting training—as well as the ability to pull off a convincing American accent—has caused U.S. directors to choose Hall among seas of talented options. Though she’s far from an uptight New Yorker, Woody Allen was convinced she could play one and cast her in Vicky Cristina Barcelona alongside Penelope Cruz, Javier Bardem, and Scarlett Johansson. (Hall and Johansson were later reunited in The Prestige.) It was a role that brought the then-25-year-old Hall widespread recognition in America, not to mention acclaim in the form of Golden Globe, BAFTA Orange Rising Star, London Critics’ Circle Film, and Gotham Independent Film Award nominations. It was a filming process she greatly treasures. A future role will find Hall starring in Patrice Leconte’s romantic drama A Promise, set in 1912 Germany and slated for release later this spring. Also forthcoming is Transcendence, as previously mentioned, in which Hall plays neurologist Evelyn alongside Johnny Depp’s Dr. Will Caster—who are partners “in science and in life,” as Evelyn puts it—and together endeavour to unlock fundamental secrets of the universe. (Warner Bros. will release the film in North America on April 18, 2014.) Depp’s Will is an artificial intelligence researcher, working to create a machine that can perceive and feel human senses and emotions, and that also possesses the collective intelligence of everything ever known. When anti-technology extremists enter the picture, fellow researchers Evelyn and Max Waters (Paul Bettany) help Will participate in his own transcendence—with a questionable outcome. The sci-fi plot provided both a new genre for Hall’s resumé and an opportunity to participate in a unique project with an exciting, stylized look. No matter the perfume she wears, Hall is comfortable in her own skin. With a candid openness and an ability to analyze herself as easily as she might one of her fictitious characters, she has a natural, effortless charm. “You know, I’ve never been that shy or nervous when acting,” she muses. “I get nerves like everyone else gets nerves. But I get out of myself when acting, because it’s about the text, or the play, or the film, or the other actor—if you concentrate on that, it’s way bigger than you. And then you have a focus. Stylist: Emily Barnes for the Wall Group. Makeup: Itsuki for the Wall Group. Hair: Ben Skervin for the Magnet Agency using Vidal Sassoon Pro Series. Stylist’s Assistant: Caroline Kornreich. Photographer’s Assistant: JP Bevins. Digital Technician: Mario Torres.